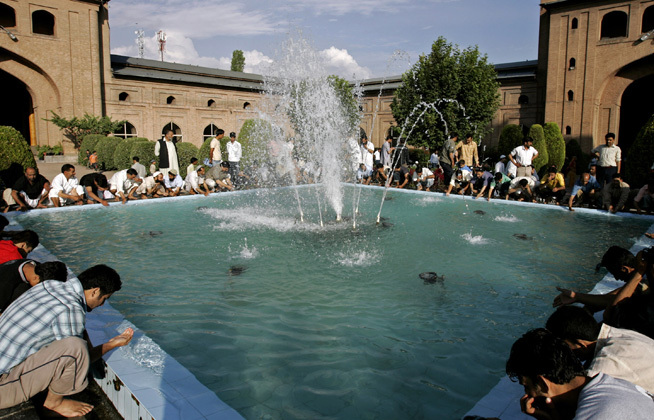 The Jama Masjid of Srinagar is situated at Nowhatta, in the middle of the old city. An important mosque in Srinagar, it was built by Sultan Sikandar in 1400 AD. Later, the son of Sultan Sikandar, Zain-ul-Abidin got the mosque extended. The attractions of the Jama Masjid of Srinagar, Kashmir include beautiful Indo-Saracenic architecture, a magnificent courtyard and 370 wooden pillars. Another feature of the mosque is the peace and tranquility inside it, standing out against the hustle of the old bazaars around it. Thousands of Muslims assemble at the mosque every Friday to offer their prayers. Jamia Masjid is known as one of the sacred shrines of Islamic followers. Be it the holiness or the constructional elegance, Jamia Masjid is quite unparalleled in every aspect. Comprised of 370 pillars of wood, Jamia Masjid symbolizes one of the best architectural specimen which survived the ravages of time ever since it was constructed in the valley of Jammu & Kashmir. While looking into the origin and construction of Jamia Masjid, the name of Maharaja Pratap Singh comes several times as it was during his Kingdom that the maintenance and repair works of the Mosque was carried out. Pratap Singh enthusiastically encouraged the re-construction of Jamia Masjid many a time and even offered financial assistance too.